Sunrise Yachts announces the sale of its second hull in the Sunrise 45m series, a project already under construction and known under the name Sunset. Project Sunset, designed by Studio Scanu, is the sistership of Dynasty (ex-Africa), which marked the first successful launch from Sunrise Yachts in this market in 2009. Built in steel and aluminium to Lloyd's class, the Sunrise 45m series has one of the largest volumes in her category, and Sunset will feature a full-length technical tunnel running from the engine room to the bow thrusters. Project Sunset is also designed by Dynasty's interior designer, Franck Darnet, yet the build will stand out with a contemporary décor featuring a bright colour scheme. It will accommodate 10 guests in five cabins, plus crew quarters for nine members. She is powered by twin MTU 10V 2000 M72 engines, giving her a top speed of 15 knots and a range exceeding 4,000 nautical miles at 12 knots. Project Sunset is the first superyacht project for her American owners. 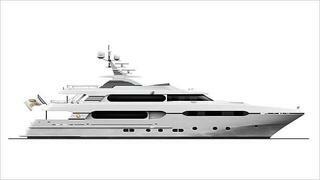 Already under construction, she is scheduled to be delivered in July 2014, and is already planned to debut to the public at the Monaco Yacht Show and the Fort Lauderdale International Boat Show in 2014. Sunrise Yachts continue the completion of four other major projects in their new facility, including a 34m explorer yacht, a 57m diesel-electric motor yacht and two 63m superyachts.